Uh-oh. There it is… the dreaded “check engine” light. Most car owners stare at this light in horror when it appears. And for good reason. The “check engine” light can mean any number of problems for your vehicle. But figuring out what those problems are doesn’t have to be a nightmare. 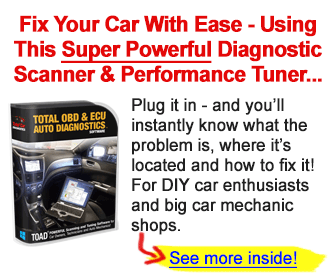 A handy tool called an auto scanner can help you diagnose your vehicle’s issues without making a trip to the mechanic. What Is an Auto Scanner? An auto scanner is an electronic device that can communicate with your car to report error codes. All cars made after 1996 are compatible with auto scanners. Some older cars have auto scanning capabilities as well, but they may require a specialized scanner. So, once you have one, what do you do with it? You need to plug it into the diagnostic connector. In the majority of modern cars, this will be located underneath the dashboard on the driver’s side. Sometimes, the location is not obvious; if you don’t see it right away, look carefully. The port may even be covered by a panel. If you don’t have a scanner yet, check here for auto scanner reviews. Whether or not you will need to turn the car on depends on which scanner/code reader you own. Once the scanner is on, it may ask you for some information, like the car’s vehicle identification number (VIN). If you don’t know the VIN, there a couple of places you can look for it. Try locating it under the hood or on the driver’s side door jamb sticker. Once you input the necessary information, the scanner can get to work. What information you receive from it basically depends on how fancy it is. A really basic device will simply give you the error code. From there, it’s up to you to either research the code online or find it in a manual if you have one. More advanced devices will be able to tell you what the code means; some will even provide you with a troubleshooting method. Once you’ve identified the problem, it’s time to take action. If you know your way around under the hood and it’s a simple problem, then ordering the necessary part(s) and fixing the vehicle yourself is probably a good option. If it’s a big job and you still want to do it yourself, check out the best car ramp. When in doubt, go ahead and take your car to the mechanic. Even though a mechanic will most likely run their own diagnostic tests, having knowledge from the code reader will help you as a customer determine whether you agree with the assessment. As you can see, auto scanners are super easy to use. They’re a great investment to make if you’re serious about caring for your car. Read more about auto repair and maintenance right here!